What is most troubling, however, is Woodward’s praise and obvious admiration for those who undermine a duly elected president by doing things like sneaking documents off his desk, by hiding stuff from him. Woodward seems to believe unelected Deep Staters accountable to no one are patriots for secretly running the country, as opposed to un-American bureaucrats undermining the essence of our democracy. To the surprise of no one, Woodward does not and is not asked to explain why, if Trump’s management style has created a “constitutional crisis,” the country is doing so well. 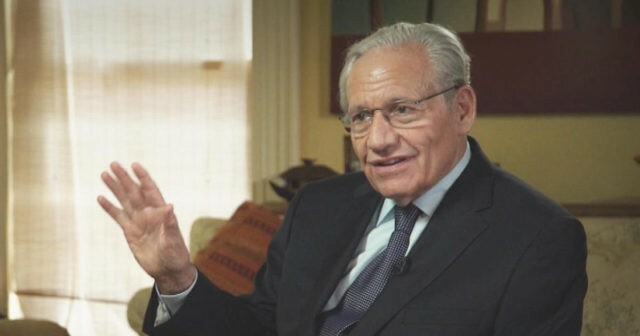 Not once does Woodward even attempt to explain how such a “dysfunctional” president who “jeopardizes” national security and the economy, has, in fact, ushered in an American era of peace and prosperity for the first time since September 11, 2001. And here’s Woodward fighting to bring back the status quo, to argue for the way things are supposed to be done, even though that way has been a disaster for everyday Americans over the last 25 or so years. D.C. has thrived, though. The Emerald City of D.C. has done just fine. Like the rest of the establishment media, as we head into the midterms, Woodward seems desperate to keep everyone’s eye off of the results of Trump’s management style, which have been an unqualified success. This is another reason why everyone in the #Resistance — the media, Never Trump, Democrats — are concocting a crisis over Trump’s style, over the usual-usual palace intrigue, which in the end is meaningless to those of us living in the real world. On the substance of Trump’s record, they got nothing, so they try to cover those results up with shallow nonsense, to scare people over nothing. And of course, fear sells books.